Those of you following the great work in progress “Gypsies of the New Millennium” now have 3 new chapters to read: Chapter 7 – Money, Chapter 8 – Van Living, and the Epilogue, where Skip tells it like it is. Soon to come is a chapter entitled “Further Reading”. I suggest that you PRINT THIS book out and put in in a binder for future reference. If you get a nice fat 3 ring binder you can add information to it as you find it. Skip’s book, published on this web site exclusively is the only classic modern nomadic living book that delves into the deep shadows of our life-style. This book tells it like it really is, and Skip is providing it here, right now, free of charge. This is an invaluable gift of information and I sincerely hope you appreciate it. The information in his book, and on this site has taken years to accumulate. 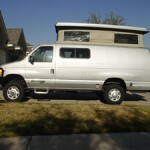 Ron McDowell has some nice photos of his Ford E-350 custom built Sportsmobile van. Here,s the link to his web page. My name is Ben. I live in the San Fernando Valley. I’m retired now, but when I was working I had enough money to pay my rent, buy food, and have some fun, mainly bowling. I love to bowl. I mean I really love, love, love bowling. My friends even got to calling me “Benny the Bowler”. It is my passion, or I should say it WAS my passion. Since I retired and started collecting Social Security, my life went down the tubes, and bowling, among other things, went with it. Here’s my story. The money I got from Social Security just barely covered my rent. And I didn’t live in a fancy place. Just a dumpy single apartment. Oh, the rent was more reasonable in the past, but it kept going up and up, until it was just under $900 per month. So there wasn’t even enough left for very much food. Some seniors get a lot more than me, they worked for the government or a big corporation and get a nice pension. Me? I started out in retail sales and stayed there. My first job was a shoe salesman. I was good at selling shoes, but you need a strong stomach for it, smelling the stink of people’s socks and nylons. Shoe stores should have a heated pond when you walk in, sort of a mini-car wash for feet. You take off your shoes and then go through this little pond, which gently soaps up your toesies and gives everything a scrub-a-dub. Next is the warm blow-dry to get off the water and warm you up. Then, instead of wax, you get a shot of perfume on your ankles and feet. At that point, your feet are clean and smelling g-o-o-o-d! Then the shoe salesman sashays in, ready to show you some cool klompers. I might still be selling shoes if that dream was real. But unfortunately, it ain’t. So, I decided to move up the sales ladder, which means move up the body so to speak. I got into a nice shop selling men’s wear, suits, ties, shirts. I liked the job, so I stuck around for 30 years until the owner died and the merchandise was taken away by the legions of unpaid creditors. Needless to say, I didn’t get a pension. But while I was there I made enough to have a very modest living and I could bowl my brains out. I learned a lot at the men’s shop. I learned how to dress nice, the different fabrics, ties, everything about men’s clothing. When I first started working there, my boss gave me a pamphlet to read, called “How Clothing Symbolically Defines a Civilization”. It explained the psychology behind the design of men’s clothes. Like the businessman, who needs a conservative suit; the actor needs something sporty and stylish with a fun tie; the politician needs a power suit, not too conservative, power without looking too expensive; a banker needs a very conservative power suit, with a tie that jumps out and whispers in your ear “trust me”! Something for everyone, even clowns and their hip-hop imitators. After I retired, my small savings went quickly. The landlord took everything. I never had enough food. I started to obsess about food. There was no money for anything else, no more bowling, no more eating out, no dating, just trying to get some cheap food, which was usually junk stuff on sale somewhere. I got to the point of putting food purchases on my credit card, then I got behind in my payments and they tagged a high interest rate on me. Then they canceled the card and sent me to collection. This meant if I left the apartment for cheaper diggs I wouldn’t be able to get another one because of bad credit. Things escalated. I was dreaming about food, waking up with night sweats at 4 am. I dreamed I had become like one of the millions of starving people of Africa, like a skinny starving kid with my face on his body. But I had actually gained a lot of weight. Although my fear was starvation, it drove me to eat and eat. I didn’t have any money to go anywhere, so I just sat on the couch watching tv, drooling over the food commercials, and eating junk because it was cheap. I had turned into a sickly fat slob, riddled with fear – fear of when the next rent increase was hitting, fear of going hungry, fear of life itself. I still had my old computer, and would send out a few emails, but I mainly used it to look for food coupons and market ads. I somehow stumbled on your gypsy cool website. At first, I didn’t pay much attention, I actually laughed out loud that there would be a website for someone living in a vehicle. What a joke, I thought. Then one morning at 4 am I woke up with the usual anxiety, sweating like a pig, my heart racing. I was at the end of my rope. What the hell was I going to do? I remembered your website. Could living in a vehicle solve my problems? I somehow knew that I was finished at the apartment. I was done. Ready to take the pipe as they say. Life was no fun, no joy, I was miserable. I went back to the gypsy cool site, I started reading everything on it. I got out a notebook, and for the next week I made notes from your website and a few others that were similar. I was desperate, but reading about others in the same boat started to give me courage. I learned there are tens of thousands of people in America living in vehicles. Yeah, in some spots it’s illegal. So what? How “legal” was it for the stinking bankers to steal all the wealth of the country? Besides, the West was settled by people who lived in vehicles: COVERED WAGONS. Remember them? I followed all your advice. Once I had made my decision it was full steam ahead. I gave notice to the landlord. I sold my car and bought a used van for stealth living. I put in carpet that I got used for almost nothing, then put down a pad and bedding. I got it fixed up like a mini RV. I rented a cheap storage unit and moved my dresser and some bookcases and my computer into it. I plan to get a laptop soon, but amazingly the storage unit has power, but no internet. I fixed up my unit like a mini apartment, since I have power I can use a hot plate and a small toaster oven. I picked up a small refrigerator and plugged it in, I’m just hoping they don’t catch on or care about that. Most of my clothes are in the storage unit, I found a couple of large cardboard boxes that had held water heaters and I rigged up a pole inside to hang suits and slacks. Your articles mentioned a health club, so I joined one. I go there every couple of days for a shower. And since I’m there, a sauna and some exercise. Your advice about food was great. I signed up at the local senior center. They serve a hot lunch every day of the week for $2. It’s a nutrition deal, low calorie meals. So in the last 7 months, since I moved out of the apartment and started living in the van and eating at the center and exercising at the health club, I’ve lost a lot of weight. I look a lot better and I feel a lot better. My budget is simple, no more rent or electricity. Only gas and occasional service for the van, which I had with the car anyway. So my Social Security check is almost all bottom line. My lunches at the senior center run $40-50 per month, the storage unit is $150, the health club is $40. I had a lot left over and I realized that I could easily get back to bowling! A wave of emotion ran over me, I literally started to cry. Years of my precious life had gone by. Now I could bowl again. I can’t describe my happiness about that, I know it must sound stupid, with all the things going on in the world, but there it is. Most lanes charge by the game or by the hour. I could bowl for an hour a day for $15 bucks, meaning I could bowl almost every day, even on my s.s., and still be able to eat, go to a Dennys or a Sizzler once in a while. You get the idea. My life has totally changed. The sounds in the bowling alley, the balls skidding down the alley, crashing into the pins, the low murmur of the bowlers, the smell of popcorn. And then there’s the sports bar. A big-screen TV set to watch the games. I can duck in there on a hot day for a beer and watch baseball for hours. I thought life couldn’t be better. But it got even better. I was checking out bowling lanes all around the L.A. Area. Many have deals on certain days, so I travel around to different alleys, I now have kind of a “bowling route”. I got noticed by people and started getting some “students”, people who wanted to improve their skills, so now I’m making a little “geeda” on the side. I got friendly with some of the managers, and a couple of them let me park the van all night, so I’m off the street and snuggled up to the wall of one of the alleys. I’m living on the property, having fun, making extra dough, no more rent sweat, eating regular. Life’s so good I could squeal. Thank you gypsy cool for making my life fulfilling again! Check out this video on a created Stealth Honda. The lady living in this Honda is celebrating her First Anniversary of freedom from rent. Her pet cat lives with her! This was not a hard conversion, fold down the back of the rear seat and clear all obstacles so that access to the trunk from the back seat is available. This makes a comfy sleeping area, your feet go into the trunk area. Be sure to cut up some cardboard to cover the windows at night or have the rear windows tinted dark so any passer-by can’t see inside. You can carry an amazing amount of stuff with you, but a storage unit is recommended. Use your cheap storage unit as your apartment – set up your dresser, have your stuff organized. Most of the good storage outfits have clean bathrooms where you can wash up. You can go there every day if you wish, get fresh clothes, re-stock your cooler with food, if lighted, as many are, set up your desk and laptop. Some units actually have power, giving you unlimited opportunities. The great thing about a stealth car like this is that you can almost park ANYWHERE with impunity, no one will suspect you are sleeping in there (unless you snore loud). Remember the rules, move your location every night! Have GypsyCool fun now that you are free from the grasp of the corporate real estate landlords. You are FREE, you are INVISIBLE, you are now a POWERFUL person who goes where you want and you do what you want! A web site called RV Solar Electric has a lot of free information, plans, and explanations of RV systems. They also offer packages and equipment. RV Solar Education Topics at AmSolar.com: Benefits of Solar, Solar Panels, Mounts, Charge Controllers, Batteries, Maintenance, Things to Consider, “STC” vs. “NOCT” Panel Ratings, Real World Conditions for Rvs, Designing for Real World Conditions, System Sizing by Actual Use, System Sizing by Rules of Thumb, Buyer’s Guide.